As soon as we saw Emma Lowe’s adorable twins, Arthur and Alfie, they melted our hearts and we knew they’d melt the hearts of Britain’s readers too. Which is why they appeared in the Daily Mirror this week. Arthur and Alfie are identical twins born with Down’s syndrome – something which only happens in one in a million pregnancies. 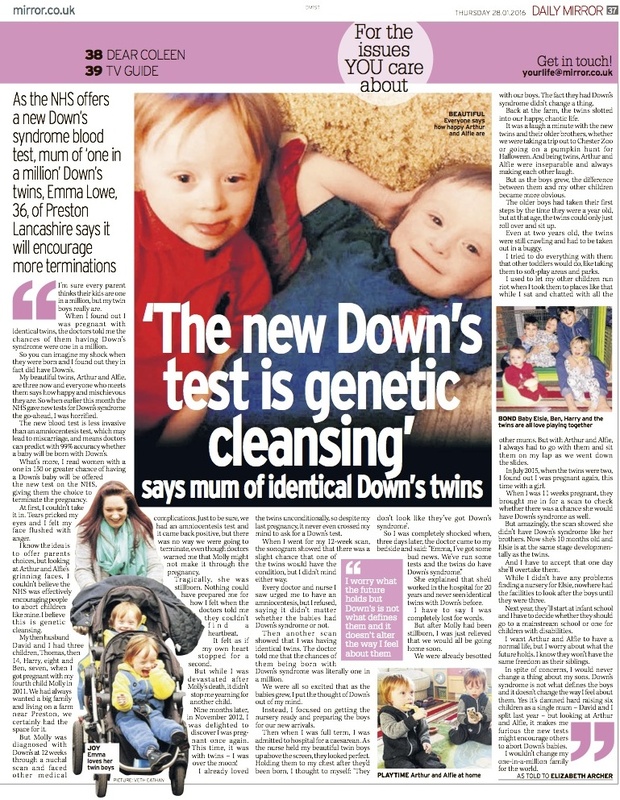 We helped Emma share her poignant and uplifting story in the Daily Mirror to give other potential mums an idea of what it’s like to raise children with Down’s syndrome, especially twins. Emma got in touch with Talk to the Press after reading in the news that the NHS had given the greenlight for a new type of test for Down’s syndrome. The new tests could predict with 99% accuracy whether a baby would have Down’s syndrome. But Emma feared it would encourage people to abort children like hers. Emma was really upset that women might want to abort Down’s babies, and wanted to raise awareness of what it’s really like to raise a child with Down’s syndrome. Before the twins were born, Emma told us how she had a daughter who was stillborn and had Down’s syndrome. 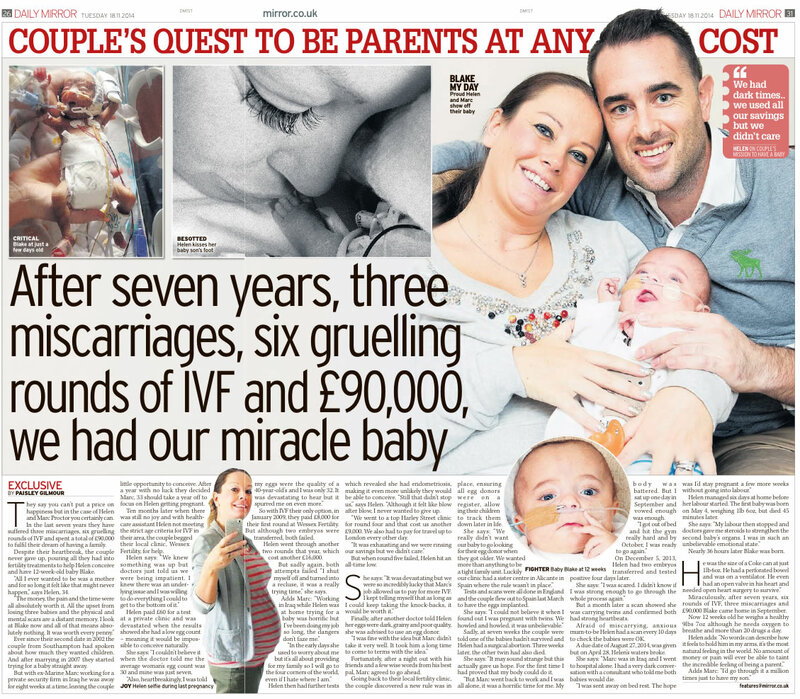 Despite this, Emma was desperate to have another baby and tried for eight months to get pregnant. She was over the moon when she discovered she was pregnant with the twins and refused to have tests for Down’s syndrome, saying she would love the babies no matter what! Then when she found out the twins were identical, she was told the likelihood of having identical twins with Down’s was one in a million, and she put the thought out of her mind. If you would like to raise awareness in the media of a cause or campaign that directly affects you, please get in touch with us today. You can reach us using the Story Valuation form on this page, or you can give our features desk a call (see our contact us page). All of our staff are not only highly trained journalists and writers, but friendly and understanding human beings too! 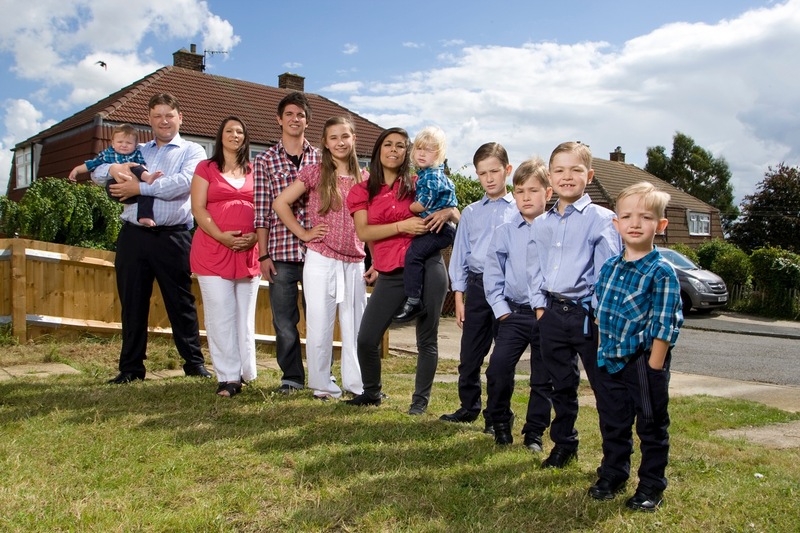 We help hundreds of people every year share their stories with the national press. Our service is free and you will keep 100% of any fees offered for exclusive use of your story. ← Previous Story How do I share our premature baby story? Talk to the Press!